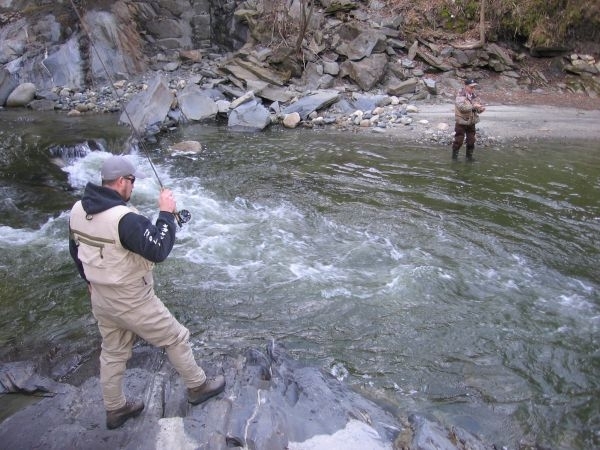 If you’re an angler looking for solitude, don’t go to the Willoughby River in the village of Orleans and wade the water below the falls on the opening day of trout season. You won’t have the stream to yourself, but you will find a stream-side community of fellow fisher-people. "From trout to tree, that’s talent, huh?" Reilly said as she quickly extricated her fly from the over-hanging cedars. Reilly is an accomplished lake angler and she said she’s won a couple of ice fishing tournaments. But opening day on the Willoughby has a special appeal of its own. "There’s something about standing on the river that’s just so healing, or so relaxing," she said. "I mean I love boats; I love the sunshine and the warmth. 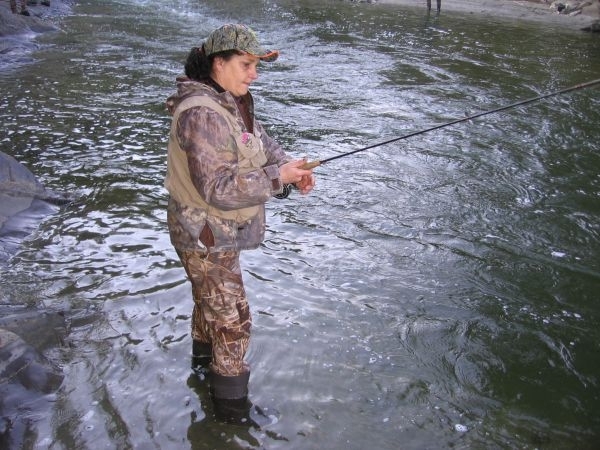 But there’s something about river fishing that is like no other." Call it tradition. Call it obsession. Fishermen and women return to the Willoughby each spring to cast for the big rainbows that swim up from Lake Memphremagog to spawn upstream. But the anglers these days are worried about a warming climate, and its impact on northern rivers. Some are calling for changes in fishing regulations to accommodate the changing climate. Steve Royer has seen about 40 opening days on the Willoughby, only skipping the April date during the few years he was in the military. "Ever since I haven’t missed a day," he said. "Usually I fish quite well. I’ve fished a long time; you know you kind of get the feel after so many years." That’s wasn’t an idle boast. Royer barely flinches when a trout yanks his sponge bait. Despite his success, Royer said the fishing was better years ago. He worries that warm water temperatures in the summer can kill the cold-loving trout. He remembers bigger runs of fish on the Willoughby. "I come here one day when the fishing was really good back quite few years ago," he said. "There must have been 300 fishermen from here way down to the bridge. But the weather too is much earlier." The warm weather also concerns angler Art Rye of Fairfax. He’s retired from the Forest Service and fishes the Willoughby often in the spring. But in the last few years, he said, the main run of rainbows has moved upstream to their spawning beds earlier. So he and others want the season to open earlier. "Most of your local people like to fish below the bridge." Rye said. "And we just don’t have it. The fish are gone. This is the second year we’ve been up here when the fish have been above the falls. They jumped for four days before the opener." Rye and other fishermen took their concerns to the Orleans County Rod and Gun Club annual opening day breakfast. "I’m just thinking of opportunities for the fishermen on the river," he said. "It’s hard to be setting home saying I know the fish are in the river up there and we can’t go for fish for them. Fish and Wildlife Commissioner Pat Berry advised the breakfast crowd to petition the Fish and Wildlife board. The 14 member panel actually sets the regulations in Vermont, not the department. Berry said his department will be ready for the suggested change. "Long before this came up I had talked to the head of our fisheries and said we got to look at statewide regulations," he said. "We need to increase opportunity where we can. Some regulations don’t make sense. It’s because of tradition or history some of which may have passed us by, or because some biologist 30 years ago didn’t like it. Personally speaking I’m not at all attached to the second Saturday in April." Anglers on the Willoughby recall many April Saturdays when the snow banks were deep and the river high and icy. This year, it was low and clear. And it was a stingy river on opening day for Joe LaFleur and his father Maurice. They remember the Willoughby’s glory days. The older LaFleur said he’s been fishing the river since he was a teenager. "I was 15-16 years old since I started fishing here," he said. "Used to be wonderful fishing. In the ‘60s and ‘70s this was really dynamite. It was good fishing. But, those days are gone. Those days are gone." It’s a complaint you hear from anglers everywhere. But some on the Willoughby worry that climate change and other pressures may be hurting the river they love.